Environment pollution is always a worldwide topic that everyone concerns, and plastic pollution is one of the most. According to statistics, there are about 1.8 pieces straws are used a day for one person on average. That may be a small amount, however there are over 500,000,000 plastics straws were consumed and abandoned in America every single day! String them together can circle the Earth 2.5 times, it's too bad for us. Join G-WEI, to use the Stainless Steel Foldable Reusable Drinking Straw, refuse to use Plastic Straw. G-WEI Straw is a portable collapsible reusable straw, sturdy and rust-proof. Easy to clean, environmentally friendly design for daily use, non-toxic and safe you & your family, a prefect replacement for your plastic straws. The body of G-WEI straw made of medical-grade food-grade 18/8 stainless steel, no metal aftertaste, plastic free, dishwasher safe, reusable and environmental friendly for you & your family daily living drinking, a great replacement for your plastic straws. 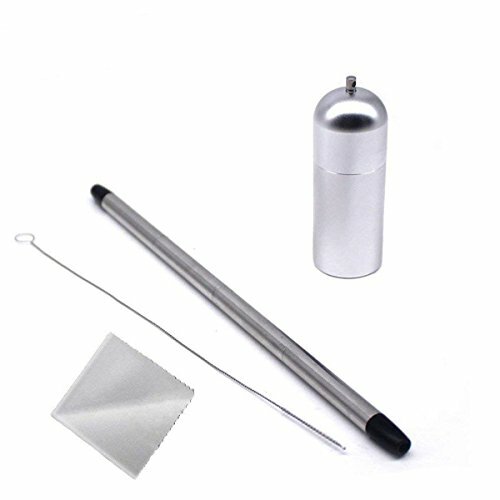 Our straw made of stainless steel material, sturdy & rust-proof. With this straw, it can be used again and again, safe and toxic free, no any smell or taste from the straw tube. When you are using this reusable straw, you are reducing plastic waste at the same time!. 1 x Flexible cleaning Brush. Environmentally Friendly: The body of the straw made of food-grade 18/8 stainless steel, no metal aftertaste, plastic free, dishwasher safe, reusable and Eco-friendly for daily use, a great replacement for your plastic straws. Portable & Collapsible: Perfect portable design with triple-jointed stainless steel, it can be easily folded and fit into a keychain-sized recycled black metal container, it is really easy to carry, so you can use it whenever you need. Suitable Length (23cm/9inch): The whole straw is about 23cm/9inch long, it can perfectly sized to fit in a glass or in many other short cocktail glasses, which is also wonderful for your home bar. Reusable & Healthy Drinking: G-WEI Straw made of sturdy & rust-proof material, won't shatter like glass ones, and they can be used again and again. After enjoy drinking, you can use the cleaning brush to clean it up in seconds for next use, drinking as safe as your daily eating. Kindly Attention Here: Please don't use it above 60° temperature to avoid the TPU tube burnt. Since the straw is made of a flexible hose, the interior is slightly compact, not suitable for smoothies, mixed juices, etc. But it is great for Tea, water, and juice liquids. If you have any questions about this product by G G-WEI, contact us by completing and submitting the form below. If you are looking for a specif part number, please include it with your message.